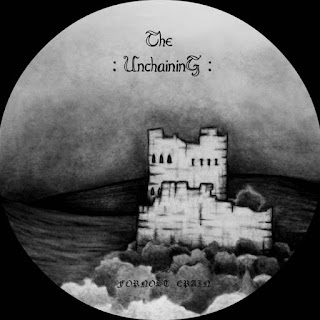 Italy's 1 man band The Unchaining have returned with a new recording that continues his epic and atmospheric approach to black metal and this is a review of his self released 2014 album "Fornost Erain". Epic sounding synths start off the album bringing in the atmosphere of a fantasy movie soundtrack along with elements of dungeon synth and after the instrumental ambient track programmed beats are added into the music along with some raw guitar riffing and grim screams which takes the music more into an atmospheric black metal direction. There is a good balance between synths, guitars and vocals throughout the recording and the songs stick mostly to a slow or mid paced musical direction and all of the tracks have an epic feeling to them along with one of the songs being very long and epic in length and the synths also bring in a great amount of medieval atmosphere's into the musical sound. Halfway through the album a brief instrumental is added onto the recording and the synths use a variety of many different sounding keys and bring a folk music feeling into the song before returning back to a more raw and atmospheric black metal direction on the following track along with some influences of doom metal being added into the slower sections of the guitar riffing and you can also hear some acoustic guitar playing being added into the music briefly, in certain sections the synths bring in a symphonic feeling while the guitars always remain in a rawer direction and on some of the songs towards the end they start adding in small amounts of melodic guitar leads and the album closes with another dungeon synth style instrumental. The Unchaining remains true to his raw and epic atmospheric black metal sound on this recording and he makes the music more interesting by always keeping the vocals grim and the guitar riffing adds a raw side of black metal into his musical sound, the production has a very dark and raw sound while the lyrics cover nature, spirituality, myth and introspection. In my opinion this is another great sounding recording from The Unchaining and if you are a fan of epic and atmospheric black metal, you should check out this album. RECOMMENDED TRACKS INCLUDE "A Stream Of Silver Swords" and "Fornost Erain". 8 out of 10.